The secretary of state will travel to Seoul and Beijing to brief on the deal. Tuesday's summit between U.S. President Donald Trump and North Korean dictator Kim Jong Un concluded with both leaders signing a roughly 400 word document in which Kim pledged the "complete denuclearization of the Korean Peninsula" in return for "security guarantees" from the United States. The agreement, while historic, left many questions about exactly how that goal would be achieved -- questions that will be tackled in part by Trump's Secretary of State Mike Pompeo, who led many of the advance talks with Kim and North Korean officials. What verification method will be put in place to ensure North Korea removes its nuclear weapons? When will the U.S. and other nations lift sanctions on the North Korean regime? What security guarantees will the U.S. commit to? What about North Korea's human rights abuses? In a press conference after his meetings with Kim, Trump said Pompeo and National Security Adviser John Bolton would be meeting with North Korean officials next week "to go over details and get this stuff done." He also said the U.S. would be working with the other nations that are key players in negotiations with North Korea, its neighbors: South Korea, Japan, and China. Though not explicitly mentioned in the summit document, Trump told ABC's George Stephanopoulos in an interview after the summit that he will halt the "war games" with South Korea, referring to the multiple annual exercises conducted by U.S. Forces Korea and the South Korean military. But the declaration caught South Korea by surprise. "You know, we’re spending a fortune, every couple of months we’re doing war games with South Korea, and I said, ‘What’s this costing?’ We’re flying planes in from Guam, we’re bombing empty mountains for practice. I said ‘I want to stop that and I will stop that, and I think it’s very provocative," Trump said. 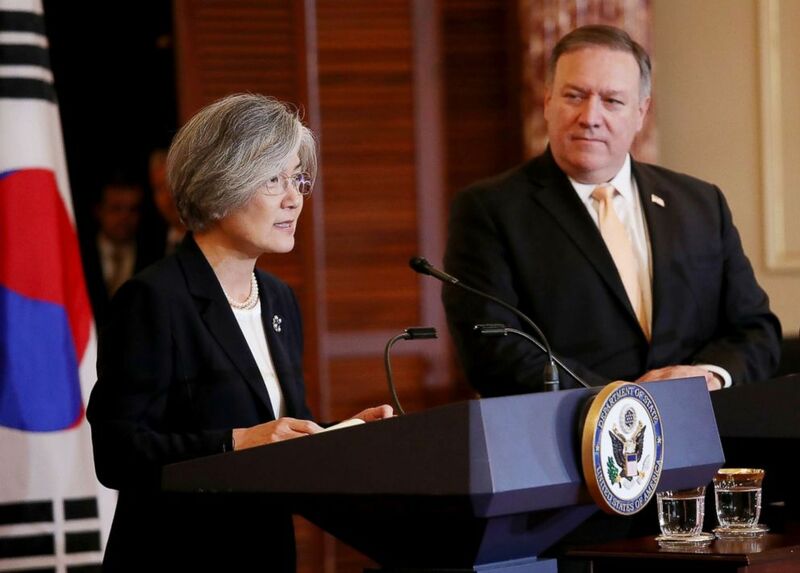 (Win McNamee/Getty Images) South Korean Foreign Minister Kang Kyung-wha and U.S. Secretary of State Mike Pompeo, right, deliver a joint statement and answer questions during a press conference at the U.S. State Department on May 11, 2018, in Washington, D.C. The two diplomatic leaders met to discuss issues surrounding the likely meeting between U.S. President Donald Trump and North Korean Leader Kim Jong Un. In a statement on Tuesday, U.S. Forces Korea said they had "received no guidance on execution or cessation of training exercises" to include the next exercise, Ulchi Freedom Guardian, which is scheduled to begin in August. A Pentagon spokesperson told ABC News that "the Department of Defense continues to work with the White House, interagency, and our allies and partners on the way forward" following the summit. "We will provide additional information as it becomes available," the spokesperson said. The issue of the joint exercises was not mentioned in a statement from South Korean president Moon Jae-in, who instead praised Trump and Kim's "courage and determination." The issue of the Japanese abductees was not part of the document signed by Trump and Kim, but Trump told reporters during the press conference that it was "absolutely" discussed. Japanese officials will likely want to know from Pompeo what, if anything, Kim promised to do about the hostages. Japanese officials may also have questions for Pompeo about what will become of North Korea's ballistic missile stockpiles. While the document talks about Kim's "firm and unwavering commitment to complete denuclearization of the Korean Peninsula," it does not mention that North Korea has to reduce or destroy its ballistic missiles, of which it conducted 15 tests in 2017 alone. The majority of those tests were not intercontinental ballistic missiles (ICBMs), but medium-range ballistic missiles that landed into the Sea of Japan, threatening the Japanese homeland. Two missiles even overflew the Japanese island of Hokkaido, triggering the country's emergency alert system that signals a possible attack. In Beijing, the issue of sanctions enforcement will likely top Pompeo's list. Trump told reporters that sanctions will remain in effect. But he also acknowledged that the Chinese-North Korean border "is more open than it was when we first started," specifically in the last two months. Chinese foreign minister spokesman Geng Shuang told reporters in Beijing that "sanction itself is not the end." "Regarding the issue of lifting sanctions on the DPRK [North Korea] you mentioned, the relevant Security Council resolutions stipulate that we shall adjust sanction measures as may be needed in light of the DPRK’s compliance, including suspending or lifting relevant sanction measures," Shuang said. 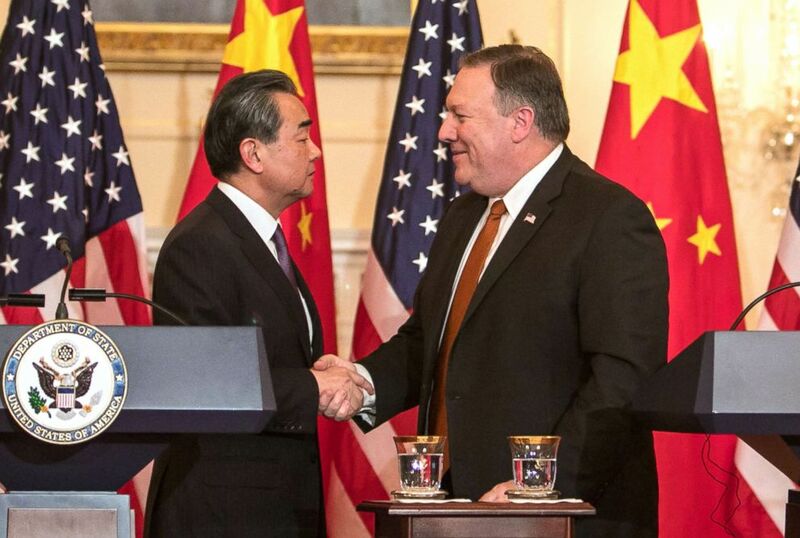 (The Asahi Shimbun via Getty Images) Chinese Foreign Minister Wang Yi and U.S. Secretary of State Mike Pompeo shake hands during a brief press conference in the Benjamin Franklin Room at the State Department's headquarters on May 23, 2018, in Washington, D.C.
China, as North Korea's largest trading partner, will play an integral role in keeping the pressure on North Korea, as to not lose leverage while moving forward with negotiations. Trump said the U.S. would not begin lifting its sanctions until he is confident about the denuclearization process. He also wants North Korea's human rights situation to significantly improve. ABC New's Conor Finnegan contributed to this report.